The team met lots of challenges in running and football. The upbeat was mastered by our footballers with the rankings 6 and 16 in the 1st Thüringer Indoor-Unternehmenscup of B-Sports which we reported about here at the end of January already. As early as the end of February, a football team of SC Keyweb 16 played another successful indoor tournament in Ohrdruf. With these experiences behind them, their mental and physical fitness was already good but were improved even further through extensive training sessions in spring. Because the big highlight of our players was just around the corner:the second FC-Rot-Weiß-Erfurt sponsor's tournament on May 15th in the Steigerwaldstadion. In the new arena all skills should be surpassed. How much have we been dreaming about a victory on the holy lawn, prepared for months, organised, fought and shared the thrill. 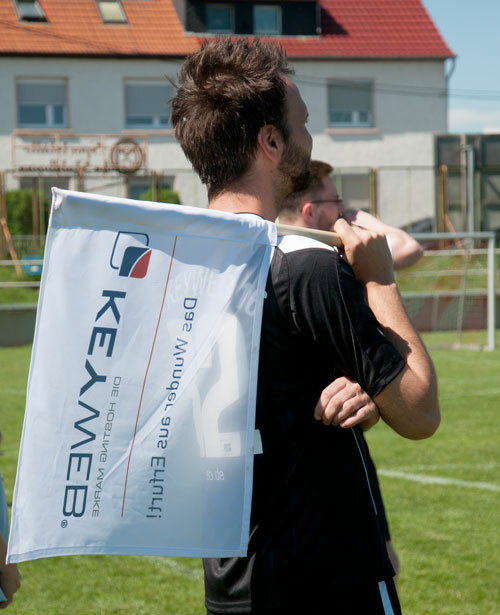 A place on the winner's podium should not be in it for us, but after thrilling games and fun on the field we were still happy about our ranks 23 for team 1, 13 for team 2 and even rank 9 for the Erfurter Torwartakademie sponsored by Keyweb. One ought to be curious how the SC Keyweb 16 will improve next year. 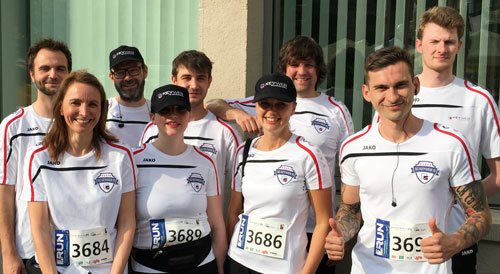 After the big sponsor's tournament, our sportsmen were mentally already at the next tasks, namely the Bundeswehr – benefit tournament on June 2nd , the Thüringer Unternehmenslauf RUN on June 8th and the B-Sports Unternehmenscup on June 10th. At RUN our running team could finally show their skills too. Euphorically with blowing flags encouraged by colleaques, our 9 runners gave everything up to absolute exhaustion for what they were rewarded with isotonic drinks and thuringian culinary specialities. In front of the backdrop of the Erfurter Dom we celebrated the fantastic performance of our relieved and proud team. Only two days later the football teams played their way into the hearts of the fans again. Summerly weather and the vibe of weekend accompanied the Unternehmenscup in Gispersleben. The own fanblock flanked by fan-friends of KNV Logistik supported energetically every game of the first and second team. Many games lost their dread thanks to sportsmanship and team spirit even when we could not always win. The ranks 14 (team 1) and 18 (team 2) are a great performance and maybe we can even improve next year. Currently we are preparing insensivley for the first tournaments in autumn such as the football tournament of MIT Thüringen on September 17th and we are thrilled to play again!